This is basically how I'm going to make my pistons from now on. All of this technical information is copied directly from the YouTube description. I'm hoping this method will help beginners and veterans alike try some new machining techniques for those of us who do not own a lathe. I have never seen anyone use a collet for machining and figured I would show you guys why it's such a good idea. There is of course a lot more I can say about little bits of this process, but instead I'll wait and ask for any questions you guys have. Good luck and get building! I like building 1" piston air guns but the pistons can be finicky. In this video I show a new method I invented with inspiration from a friend (thanks Ingemar!). The reason for using a floating o-ring is that the piston can be relatively loose compared to the pipe it sits in and still seal perfectly. This works great for pistons cast out of a bulk purchase of fiberglass resin because they shrink while curing and cannot retain a perfect seal on their own. For my guns, the pistons HAVE to shrink smaller than the pipe itself, because the construction I use chokes the pipe enough that a perfectly made piston wouldn't be able to fit (this simply happens from hammering a 1" pipe into a 1" female adapter). Most spudders struggle making a cheap, light piston without a lathe. This typically leads to casting with marine epoxy, or making a piston out of bolts and washers. I don't like either of these methods personally, because cast pistons (1) tend to shrink for me and (2) the poor tolerance of the small PVC fittings makes it literally impossible to put a tight fitting piston inside and have it be removable. Bolt and washer pistons made of solid steel tend to be heavy and even if they are easy to fine tune, cost me more resources than I am willing to use. Buy a lathe, but that's expensive. Build a lathe, but that takes too much time and effort. Use a drill press, but mounting a piston in one can be tricky. I was pondering how to mount a self centering chuck on a drill press, but that's still expensive for my endeavors. Making a self centering chuck seemed out of the question until my friend Ingemar asked if I could buy a collet. I instantly realized I could make one using the exact same pipe I use to cast my pistons, so it would be a perfectly sized collet. 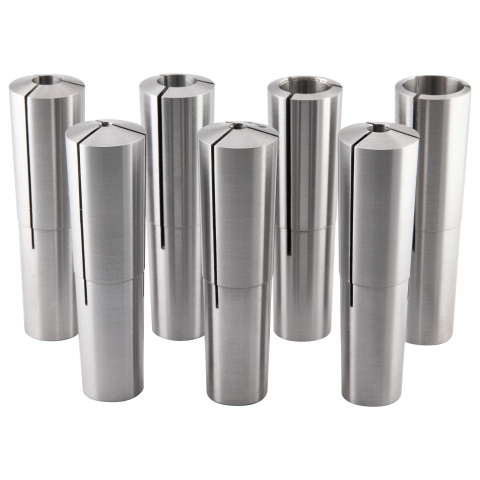 The collet is made via a series of reducers so that ANY NOMINAL SIZE PISTON CAN BE MOUNTED TO A DRILL PRESS FOR LATHING. I have personally never seen anyone use collets, yet they are very easy to mount material into and are self centering. First I explain how I made a collet from scratch for very cheap (~$8 worth of materials!) that can be tailored to custom needs. Then I demonstrate cutting a blank piston cast from fiberglass resin. The piston is finished with a floating o-ring groove, check valve notch, sealing face, and bumper material. Lastly, I demonstrate the working piston in a test gun. As an aside, the reason I simply shoved a 3/4" bushing into a 1" pipe via heat gun was to minimize parts. Feel free to actually use a 1" bushing and a coupling, as I probably would have to for a 2" piston, but the shorter you can keep the collet the more stable it will be. Also, the domed affect was most likely from the chisel being at a slightly downward angle. Keeping the chisel horizontal or slightly upward might eliminate this problem. Used to do this with my drill press as well, but never made a collet attachment. Pretty cool! Working with epoxy must make it much easier to cut. The collet idea is good. Very good, even. But there's a reason chucks like that are known as "knuckle busters". I'd also point out that you've got way, way, way, too much unsupported work poking out of the chuck. Everything from the drill chuck itself, all the way down to the work piece, is unsupported, and that's really bad for precision and surface quality, especially when you consider the spindle bearings aren't made for radial loads. IMO you really need to put a centre on the "tailstock". Personally, I'd forget the collet chuck approach (unless I could get collets of the required size for my spindle taper - 2MT collets, which will fit in most drill spindles, go up to 3/4" or so) and go with turning between centres. A 2MT dead centre, which can be easily modified as a driving centre, costs around 5 bucks and won't require any futzing to put a collet puller in the spindle. After that, there's toolholding. That's also as sketchy as a sketchy thing. More work required. Yeah this is probably the sketchiest thing I've done with power tools, but I was just looking for a cheap method that's precise 'enough' for what I build. I never thought of using a 2MT dead centre (not sure what it is) but if it's cheap, safer, and precise I'll definitely look into it. Thanks for the feedback! The majority of drill press spindles have a number 2 Morse Taper fitting. The drill chuck itself is fitted using a tapered attachment - removal of the chuck is done by shoving a tapered flat through a slot in the spindle, and knocking the tapered attachment out. If you want real accuracy, though, you turn between centres. The work is centre drilled at both ends, mounted between two 60° points, and driven using a "dog" either using a drive plate or a driving centre. 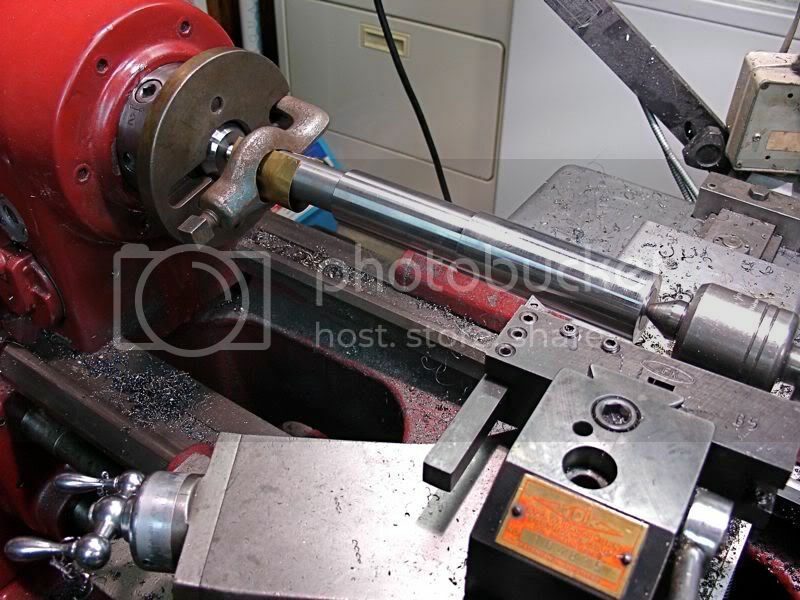 Here's a lathe set up; the dog (the manky looking cast iron bit) clamps to the work and engages in the drive plate. Drive plates won't work on a drill press, though, so you need a driving centre. That's like a normal centre, but has a sticky-out bit that drives the dog, you make one by drilling a transversal hole in a normal centre and threading / gluing / whatever a piece of rod into it. I really would like a centering tool for the opposite side of this wonky collet set up, but if I drill a hole into both ends of my pistons just slightly off, I would have to shave them down into a perfect cylinder again but they are already at the size I desire which is why I used an external rather than internal centering method. I'm by no means a machinist so sorry if my knowledge seems so ignorant haha. Still experimenting with methods and devices, so I'll see if I can make a safer, more precise 'lathing' setup. I should probably be doing even more research. Edit: Actually I think I just got a pretty sound idea for how I can get this to work with my rig but it'll probably be later in the week when I can finally try some stuff out. I'll post back with my findings sometime. Also be aware that a static drill bit will "seek" the centre of a piece of rotating work, which is why lathe drilling is usually done with a static drill in the tailstock.